This is long overdue. So much for a blog post every week. I need to work harder at maintaining that schedule. I figured Iâ€™d have dev stuff to discuss every week and it wouldnâ€™t be a problem. At the moment Iâ€™m so busy with my current contract that Iâ€™ve had no time for anything else, and I canâ€™t legally talk about the contract work. 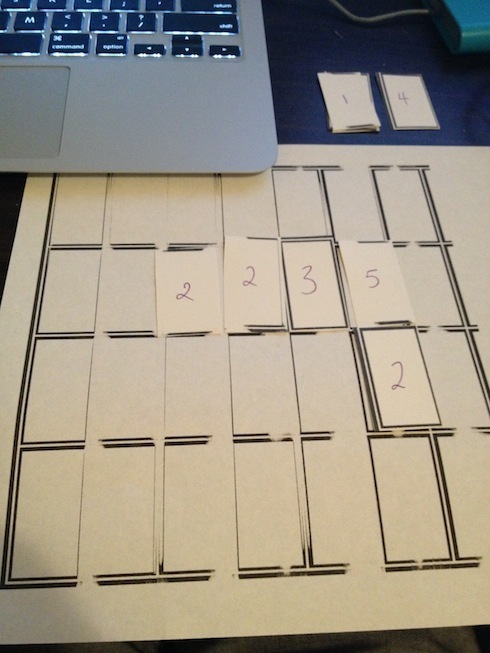 I have begun some paper prototyping of a game idea that Iâ€™m more than a little excited about. Itâ€™s not the point and click story my brother is currently working hard on (the first draft of the prologue for that is due in a couple of weeks, so Iâ€™m seriously looking forward to reading that and letting it spark a hundred concepts and ideas). Nor is this the platformer that the artists are still experimenting and exploring art styles and themes for. This is something else. Something thatâ€™s been rattling around in my brain, half formed, for some time. Something that will sit somewhere between a puzzle game and a strategy game. One or two player. Beautiful environment. Single iPad play (one of my favourite features for a game and hard to come by). And the most exciting part for me, based on the famous cellular automaton Conwayâ€™s Game of Life. Iâ€™ll add a pic below, but itâ€™s not real exciting just yet. See, not exciting. But proof something is happening. So, if thatâ€™s the extent of the game deving (that I can discuss), then what shall we talk about. Well, Iâ€™ve been thinking about strategy games a lot lately. About what attracts me to them. Why I like the ones I like and not others. Iâ€™ve been thinking about how you can take an existing game and tweak it, extend it, to add new layers of strategy and depth. This is incredibly hard for me. I donâ€™t know if itâ€™s just a flaw in my particular way of thinking, or something that I can learn, but Iâ€™ve never been particularly strong at thinking outside of the box. I like to think I have a large repertoire of boxes to pull from, but outside of them, I basically draw a blank. But I have heard this challenge given to people I know. Some have been going for a job as a game designer and have had to do exactly this. Take an existing game and build on it. Extend it. Maybe improve it if you think itâ€™s flawed. I had the perfect example for you. But Iâ€™ve changed my mind. Iâ€™m not going to tell you about it just yet. Iâ€™m going to actually issue the challenge. Iâ€™m going to give you a game, and between now and next week, I want you to attempt to extend the game. I was going to say extend the strategy, or add layers of strategy to it, but thatâ€™s too limiting, I donâ€™t like that. There are many many ways to change the way a game plays. Many many aspects to what makes a game enjoyable, or addictive, or even financially succesful. So I wonâ€™t be so confining. Iâ€™ll simply ask you to extend it in some way. And to justify what youâ€™ve done. In the comments, tell me what youâ€™ve changed or added, why you chose it, and what results you would expect to see, or better yet, play test it and share your experience. The final piece you need is, of course, the base game. The game is Chess. Yes, I know. An extremely old game that has been modified many times over the years to varying success. Adding layers of strategy or even expanding the strategy existent in the current form sound daunting. Itâ€™s already an immensely tactical game that requires playing both the pieces on the board and the player across from you (no unlike poker). Iâ€™ve chosen chess purely because it is the game my example was related to. The example was an extension of Chess that was created by one of my best friends and his brother when they were quite young. I donâ€™t want to say too much about it, but if any of my readers know how to play Gurnett Chess, donâ€™t blow the surprise, Iâ€™ll explain the variation next week. For the rest of you, there are a few things that I think need to be kept in mind. Extending the game, improving it, even adding layers of strategy, doesnâ€™t have to mean adding new rules, new pieces, new peripherals. Thatâ€™s one way to go, and certainly the way my mind tends to move, which is why I donâ€™t consider myself any good at this. But the problem there is you are messing with a game that many people know how to play. In my experience there are basically two types of people related to Chess. Those that know how to play, and those that have convinced themselves itâ€™s too complicated to learn. Adding new pieces, moves or too many new rules will convince the second type that there is absolutely no way they could learn to play your game, and alienate the first group who feel comfortable in their knowledge of the game space. Itâ€™s a tricky thing to extend and modify the game in such a way as to not alienate both. One direction may be to simplify the game and aim it at those that feel they canâ€™t learn Chess. Maybe create a â€œgatewayâ€ version to the original game. Think about what the game is supposed to represent in real life and find a way to make it less abstract perhaps. More strongly tied to those real things. Iâ€™m going to leave it there. I look forward to seeing some interesting takes on Chess. Hopefully Iâ€™ll get some people responding. I was also going to spend some of this post analysing/reviewing a game called Banner Saga Factions. A turn based strategy that is free to play. I might leave that for another post, but for now, let me highly recommend it to anyone even remotely keen on strategy gaming. Itâ€™s a fantastic TBS with a truly beautiful art style (though a little violent, being based on viking mythology and culture).